This is a great book about guitars and amps. It is a chronological listing from the middle ages to the present. Each chapter covers a stretch of time. The first chapter is the “Ancestry of the Guitar “. Chapter two covers the “Early 20th Century “. Then by chapter four, “The 1940’s”, each chapter covers a decade. There are short descriptive paragraphs covering, what seems like, nearly every make and model of guitar and amp ever made, along with pictures of many of them. There are also “Battle of the Axes”. Which are comparisons of the characteristics and the pros and cons of two guitars, such as the “Battle” between the Fender Strat and the Gibson Les Paul on page 162-3. There are many artist’s pictures and short articles describing the contribution they made to a guitar design. There are also many ads and catalog excerpts, showing a historical perspective. This would be a worthwhile addition to any guitar players library. I give this book 4 1/2 stars, because I would have liked to see a few more pictures. I received this book for free from NetGalley, but I like it so much that I plan on purchasing a couple of copies for gifts. Did you know that John Lennon played an Epiphone Casino? Or that the guitarists of Sonic Youth and Wilco favored Fender Jazzmasters? Or that Dave Grohl of Nirvana and Foo Fighters so loved the Trini Lopez that Gibson created a signature model of it for him? They’re the biggest and baddest axes in the world—and they’re all here! 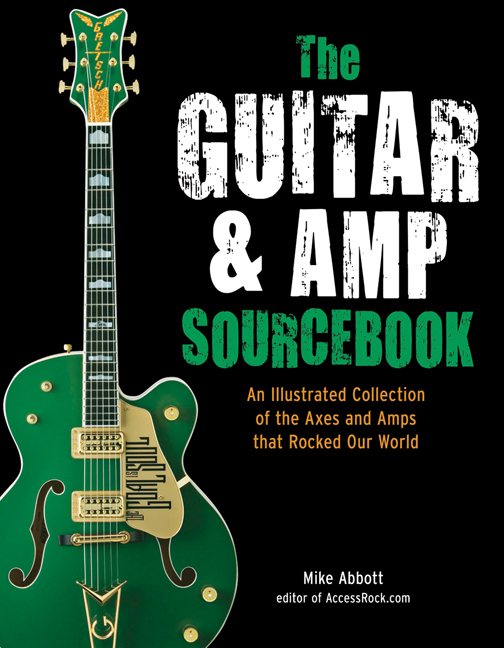 The Guitar & Amp Sourcebook is an illustrated history contains the most important guitars and amps—the ones that have rocked our world and changed history. You’ll get the skinny on the most popular models, the vintage pieces, and the rare beauties, as well as brand comparisons like Gibson vs Fender, recommendations for the best beginner equipment, and a listing of the guitars used by popular musicians. Sprinkled with quotes from musicians on their personal favorites and advice from a pro about the best pieces, this is the book no guitar lover should be without. Author Mike Abbott is a pro guitarist who has been performing, recording, and touring with bands for over 15 years. He has performed with the Rolling Stones Horns, Sammy Davis, Jr., Burt Bacharach, and Paul Schaffer from the David Letterman Show. He is also the editor and owner of a music website.